You can book a private group show with the movie starting 9-10AM with a minimum requirement of 15 tickets purchased! 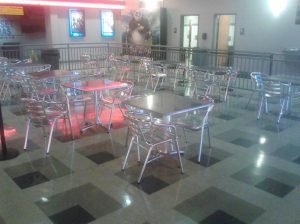 You can decorate and use our Lobby for parties before or after the movie so long as it starts by 10AM, and no outside food or drinks are allowed inside the actual theater. There is no extra charge for booking a party, just the tickets. Please give us one week notice to schedule your group! The group rates also apply the same during regular business hours, but those shows are open to the public.